Feel the power burning behind those dark eyes! 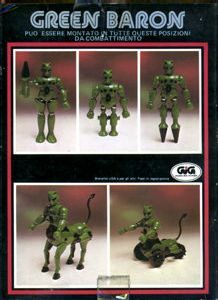 Green Baron and King Atlas have some of the more ominous box art in the Micronauts line. Too bad these were released only in Italy by Gig. 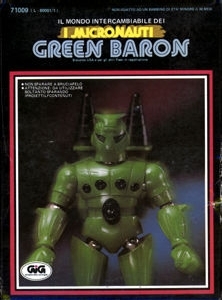 With the remolded head and the more somber colors, I think Green Baron would have been a real hit here in the States. Take special notice of the head. It may be hard to discern here, but up close it becomes obvious that the head used for the photo shoot was definitely a prototype! You can see the sculpting marks and roughness when compared to the King Atlas photo.